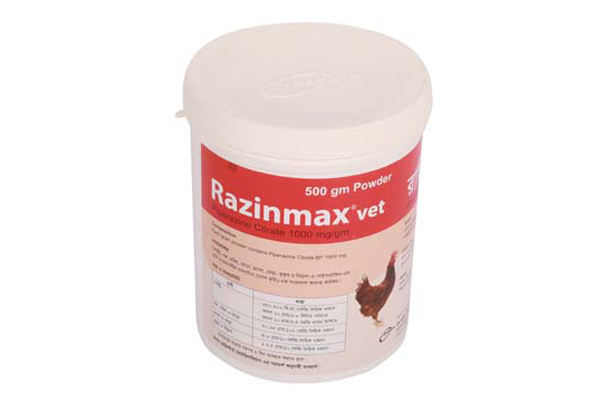 Razinmax Vet: Each gram powder contains Piperazine Citrate USP 1000 mg.
Razinmax Vet is an anthelmintic with activity against nematodes (Round worm). It closes neuromuscular transmission. As a result parasite suffers from flaccid paralysis and dies. 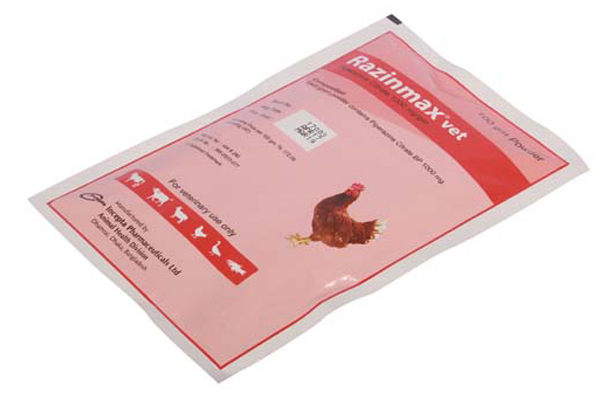 Razinmax Vet is used in infestations produced by nematode sensitive to Piperazineeg. Ascaris, Oxyuris, Strongyloides&Trichuris of poultry, cattle, buffaloes, horse, goat, sheep and dog. 2 days250-500 mg/kg body weight or use 10 gm powder in 6-8 litter of drinking or 10 gm/3.5 kg feed for 100 chicken (4-6 weeks) or 50-60 pullet or 20-30 layers. Razinmax Vet is very safe. However, emesis and softening of the feces may be reported. Water supply should be off for 12 hours before using the drug. Sufficient clinical data is not available.